Automattic has released fine plugin for WordPress — WordPress Widgets which can be used to personalize your blog without knowing HTML. You don’t need to edit your WordPress theme at all! Just choose required widget, drag and drop it to sidebar. There are many widgets already created by different developers which you can use on your blog. I failed to find widget which can get several chunks of HTML code and show one of them on sidebar therefor I decided to create it myself. You can download Ad Rotator plugin, then you need to unpack, copy adrotator.php to your BLOG_DIR/wp-content/plugins/widgets/ directory and activate it on Plugins page. You can see the sample on this blog: there are several of my favourite books from Amazon on sidebar, and only one of them is shown at time. You can enter title of the your widget, and HTML-code to display. Different chunks are separated with <--more--> code. I think after installing the widget you should explain how else to go forward as there is no documentation after that. I installed the widget and activated it in WP and there is no title nor link where i can add banners and such. hey there, great plugin! it works great. quick question though. i’d like to run multiple of this widget simultaneiously, but when i rename the widget, upload, and activate it, i get a “can’t redeclare” error in php. is there any way to run a few of these at the same time??? nevermind my moronic question, just saw at the bottom of the page the “how many ad rotator widgets do you want?” question. Totem: Do you have the WordPress Widgets plugin installed? Ad Rotator is a widget for this plugin and it can’t work without WordPress Widgets. When you have installed Ad Rotator you can see it in the list of available widgets. Just drag and drop it to your sidebar and enter ads. Pretty simple, isn’t it? The next step would be a “category sensitive” ad displa for the sidebar, so one could choose which ad(s) to display separately for each the category. Fantastic little widget! Works very well. I was just thinking, for ease of use is there anyway it could be set to link to and rotate a WordPress post? This is a great tool. Thank you. Is it possible to turn off the randomization part of this widget, so that it displays blocks of text serially rather than randomly? Great plugin! I’d love to know if it could be modified to use in the body of the post. Fantastic widget! Works like a charm. Thank you very much! Bravo!! List of useful Wordpress Plugins - Reaper-X . :[ ID ]:. Thanks for the simple, yet really useful widget. Keep up the good work. i’m using your widget/ plugin thank it works well. But i seem to be showing every ad at the same time? Even when i use the more tag? I thought it should rotate the ads? Am i doing it wrong? Macuha.com - » Kukote’s New Home! Really like the concept behind this widget. Is there any reason why the amazon ads aren’t showing up in the box? 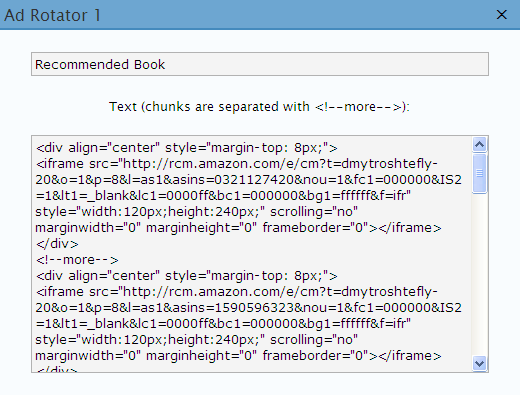 All my other widgets work fine, but for some reason the amazon links for individual books won’t show in this widget or a regular php widget. Any chance there could be a conflict with my theme (anaconda) or another widget? Any help or suggestions would be appreciated. Thanks. What does the Oddball Widget do? The Oddball Widget will provide webmasters with easy to install, fresh daily content for FREE! The Oddball Widget allows the webmaster to choose how many funny ebay auctions they wish to display in their sidebar. Oddball Auctions will update these auctions every day, so webmasters will have fresh, interesting content every time a viewer returns. Unlike most widgets and RSS feeds, this widget will not “steal” your viewers. If a viewer clicks on an interesting auction, a new window or tab will open, so you don’t lose your viewers! The auctions listed will not have any adult items, so this widget is suitable for any web site. Additionally, if a webmaster has an ebay affiliate account, the widget allows them to enter their PID, and receive credit for 50% of the clicks from their site. Once someone clicks on an interesting auction, ebay places a 7-day cookie on their computer. So, if the viewer buys ANYTHING on ebay in the next 7 days, ebay pays a commission. For example, if one of your viewers clicks on “image of donald duck in a pancake”, then leaves ebay, then, the next day they buy a car from ebay, ebay pays a commission on the car! This widget is fully stylable using CSS, so it will fit in perfectly with the look of your site. The widget zip file consists of only 2 files, a brief readme.txt with installation instructions, and the widget itself. The widget should be installed in your /wp-content/plugins/widgets folder. I was wondering if you’d like to add this widget to your site. So far so good. Nice plugin. Running 2.1.2. And now it takes php as well.. If you like a similar function but just for anywhere in the body, I just finished programming a piece of code… it is slightly limited in that you can only use it in one location for now..
Leave a message here if you like to test it. If you don’t mind, I could integrate your code with the plugin and add some options (to render or not the div, to execute or not PHP code). Of course, I would add “thanks” to the changelog along with the link to your site. I have set up two adrotator widgets, one with linksynergy ads and one with amazon ads, however they are both displaying the linksynergy ads. If you view source you can see it references adrotator-1 and adrotator-2. If I swap the code around I just get the amazon ads. At one point it was even displaying google ads (i am using adsense manager). I have a similar problem to the above user. I have used this widget on several blogs in the past and they all worked great, but now i have one new blog that i just built and it got set up with wordpress 2.2 and if i put in more than on instance of the rotator they will all show the same rotator. is there something in w-p 2.2 that i can change to fix this? First of all, great plugin. I’m finding it very useful. However, I am running into the same problem that Steven seems to be having. I can only run one ad rotator at a time, because the second rotator simply reflects the same ads as the 1st rotator even with different chunks of html in them. What would you suggest I look at? since I can’t remember what exactly I changed, but you can download the working version from my site. Dmytro Shteflyuk I dont know m8 if you got my email a while ago with the updated code, but please post a later version here when ever it is ready. I dont like putting a link up on my site, but feel sorry for those having issues using your great plugin! Great plugin. Works well. Is there a way to run it in multiple rotator? on the WP screen where you manage your widgets you can specify how many adrotators you like to use. Set that number and apply and new ad rotator widgets will show..
Is it just me or is the server down ? 1. Right click and save target (or link) as…. – http://www.jrbeltman.com/downloads/adrotator.php is the working version of Dmytro’s sidebar widget! Juist like to say I LOVE this versatile widget. THANK YOU! I use it on my site to rotate album covers, giving a fresh look to the graphics on every visit. Superb! Why the maximum of 9 rotators? Any way I can change something to make it higher (30?)? Or is there a WordPress limitation? how to delete this plugins. please help me. now i can’t use this plugins. i will add after some time. i added this plugins. but its not showing in plugins list. how can i deactivate or unistal.